13 Delta pilgrims abscond in Israel – Royal Times of Nigeria. 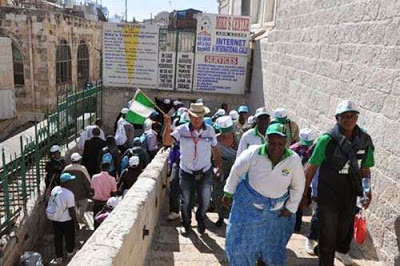 The Delta Commissioner of the Bureau for Special Duties, Mr. Ernest Ogwezzy said no fewer than 13 pilgrims of the 156 who travelled to Israel on pilgrimage has absconded. Ogwezzy who spoke in Asaba on Monday said that the pilgrims to the Holy Land, made up of 146 people and 10 officials, were sponsored by the state government. He assured that the government has put in stringent measures to check future occurrence.